Discussion on Active Shooter Awareness and Preparedness with keynote speaker Dr. Gregory A. McDonald, D.D.S., F.I.C.D., K.T.J. 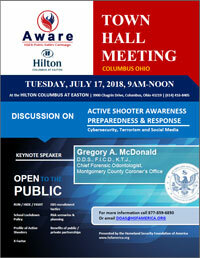 at Hilton Columbus at Easton on July 17, 2018 from 9am to 12 noon. With keynote speaker Gregory A. McDonald, D.D.S., F.I.C.D., K.T.J. 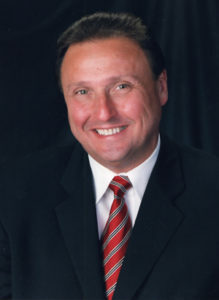 Dr. Greg McDonald is general dentist in Springboro, Ohio. He also serves as the Chief Forensic Odontologist (Dentist) at the Montgomery county Coroner’s office and Miami Valley Regional Crime Laboratory. There he leads a Forensic Dental Response Team consisting of 31 other trained dentists to respond in the event of a mass disaster. In addition, he is an investigator/forensic dentist for Warren County Coroner’s Office. Dr. McDonald was honored to be chosen, along with eight additional dentist across the United States, to be first responders at the World Trade Center on September 11. He has received many training courses from the DOJ and other federal agencies on mass disaster, preparedness and response in the event to another event. In addition, he has served as the President of the Board of Trustees at Clearcreek Township, in Warren County. At the state level, he served two terms and President of the Ohio State Dental Board. We’re working to raise active shooter awareness and preparedness to help save lives. Since 1966, nearly a third of the world’s mass shootings took place in the U.S. According to data from 2013, incidents in schools and businesses represent 7 out of 10 active shootings. Some of the country’s most high-profile mass shootings have occurred there, including Sandy Hook, Columbine, Virginia Tech and San Bernardino. 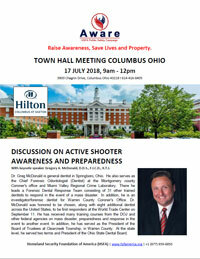 We’re conducting active shooter awareness and preparedness outreach all across America.